DD: What brought you together for this show? JM: I’ve admired her work for years, since a local art exhibit in a barn where I saw her seed pods and her incense burners made from clay. When we got to know each other, she invited me into her Tuesday afternoon art workshop. A group of about 8 artists drink tea, talk shop, and make art. Most of my small pieces in this exhibit were created or at least started in that workshop. JL: When Joel invited me to have a show together, we decided to show works that have common themes between us. With my guardian figures and his Hebrew alphabets seemed like a good way to look into our respective traditions. DD: I see a benevolence in both bodies of work. Is this sense of well-wishing towards your viewers actively present while you work? JM: In the studio, what I’m feeling towards my viewers is vague because they’re not there. There’s a general feeling of benevolence, not just towards the people who will see my letters, but towards all humankind. In middle age, I want to reach outside of myself, I feel a need to respect and include “the Other.” There’s no satisfaction without brotherhood and sisterhood and justice. If I can succeed in bringing out the inherent beauty in the Hebrew and Arabic letters, my hope is, viewers will feel the beauty within us all, interconnected. JL: When I make guardian figures, I feel deep connection to my ancestors and my culture. There is a shared sense of well-wishing that stone masons of centuries ago had when they were making the pieces. DD: Can you tell us more about the creative impulse or experience that led to these sculptures and paintings? JM: I was doing a series of paintings of Hebrew letters, trying to make them iconic, to show their simple power. Then, the war in Gaza kept seeping into my thinking, a sense of hopelessness. And my series of Hebrew letters suddenly felt besides the point. It seemed to me that the only way to make them relevant, was to place Arabic letters next to them, on the same page. The idea heartened me, placing the letters side by side, letting them blend. JL: There is a definite sequence of events that led me to make the series of guardians. About 6 years ago, when I first encountered the stone guardian figures in Korea, I was so struck by their simple, abstract shape yet powerful presence. I was especially drawn to the Guardian of Fertility which had a baby in the middle of the body. Also a pregnant stone lamb left me a very deep impression. I came back thinking that someday I will make these figures with clay. Up to that point, I had been making various botanical forms inspired by plants and flowers in my garden. When I returned home from Korea, to my utter consternation, my unmarried daughter announced that she was 6-month pregnant. In the emotional turmoil of dealing with the situation, making the usual botanical pieces felt totally irrelevant. Instead, I started making Guardians of Fertility which became such a turning point in my life and work. Jaeok Lee Guardians of fertility #1, Clay, 9"x8"x25", 9"x7"x23" $1500 for 25," $1400 for 23"
DD: I am struck by the textures and graceful use of negative space in all of this work. Can you tell us more about your choice of materials or your process? JM: My subject matter, the letters of Hebrew and Arabic, is inherently graceful. I make a stencil for each letter. Then I use the stencil as I paint. That way, I don’t have to worry about going outside the lines and making a mess. The art stays clean. Also, if I want to start over on another sheet, I can reuse the stencil, so it’s efficient, theoretically. Usually, I need to modify the shape of the letter as I work. I’m ruthless when it comes to making changes in the art. I use razor blades and sandpaper to remove whole areas, then repair the surface with more fine sandpaper. You can see all these revisions. JL: I use clay containing a fair amount of sand and use a coil-building method to form the shapes of the statues. I very much enjoy creating surface textures with various kinds of tools that I improvise. They are fired to cone 6 which is 2232 F with layers of stains and slips. DD: Is there anything else you would like to share? Something we might not be able to see or know without you telling us? JL: The Korean Guardian sculptures which became my inspiration are made out of stone. Each province in Korea has different types of stones and different shapes. For instance, there is an island off the southern tip of Korean Peninsula called Jeju which is formed by volcanic lava flow. The stone and the shapes are quite distinctive from others in the mainland. Traditionally, people used to pray to the stone figures for prosperity, fertility, good harvest, protection from illness, etc. 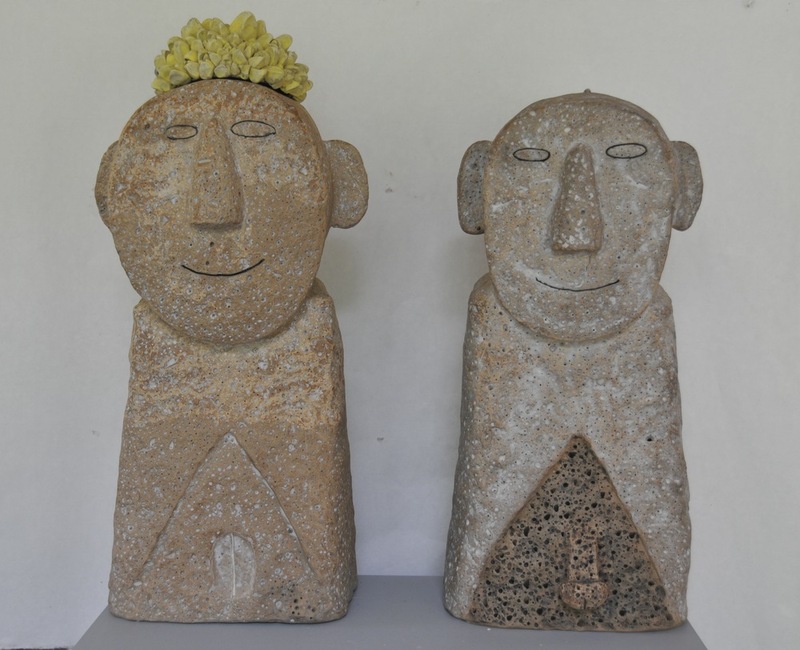 These figures were placed at the entrance of the villages or on both sides of the tombs. They range from 1 foot to 6 feet or more in height. After the introduction of Christianity, they were shunned as superstitious and backwards. Now they are housed in the museums or became collector’s items as beautiful work of art. DD: What is your cultural background? JM: As for Hebrew, as a child I went to Hebrew school at our synagogue in Long Beach, California. In my teens, I spent some times in summers on a kibbutz, and learned some more Hebrew. Then, as an artist, I learned Hebrew calligraphy. But I have no background in Arabic. When I decided to do this series, I started by copying the Arabic letters from an alphabet chart. Then, I enrolled in Beginning Arabic, in a nearby mosque. I’m learning, but it’s not easy. JL: I was born in Seoul and came to Boston when I was 20 years old. It took me a long time to make roots here and to feel at home. Whenever I go back to Korea to see my family, I fill myself with Korean art, music, literature and culture in general.